It’s officially fall — we hope you’re catching your breath in the fields and watching the new season edge its way in. The FDA just released a new draft of Food Safety rules and significant improvements were made. The agency certainly listened, but we’ll need your help to ensure that the final rules work for local farms. Read more about this campaign, NYFC at the People’s Climate March, our work to make farmland affordable and upcoming events in this September newsletter. Last Friday, the FDA re-proposed draft rules under the Food Safety Modernization Act (FSMA). These rules aim to ensure a safe food supply by tightening the food safety regulations on farms and food facilities. The original rules, proposed last year, would have placed disastrous burdens on small, diversified farmers. In response, NYFC members sprang into action. NYFC volunteers hosted an incredible 70 letter-writing parties across the country, generating nearly 1,000 comments out of the 18,582 total submitted. It is unusual for a federal agency to re-propose draft regulations such as these. Taking this step shows the depth of the problems with the rules and the seriousness with which the FDA has considered our comments. The new proposed rules make a lot of progress toward crafting regulation that works for small farmers. Read a summary of the new rules here and learn about what’s next. 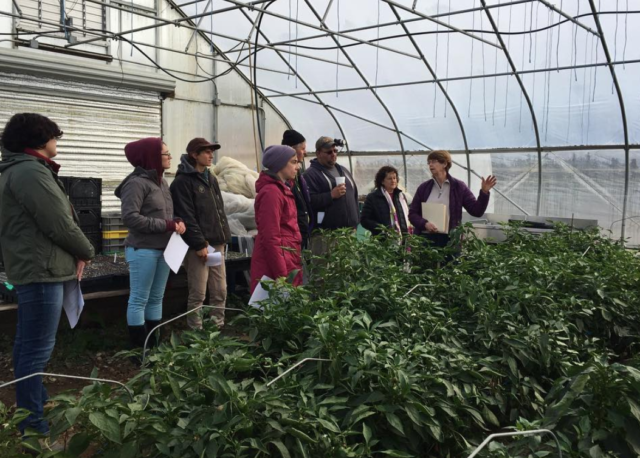 More than 40 land conservation professionals gathered this past weekend in Providence, Rhode Island for NYFC and Equity Trust’s Land Access Innovations Training. The training brought together staff from some of the top agricultural land trusts in the country to address the urgent need to protect farmland as working farms and help the next generation of farmers access prime farmland. Participants networked, discussed challenges, and shared tools and programs they have developed to keep farmland in the hands of farmers. The demand for this training and working group marks a growing shift in the conversation about farmland conservation. 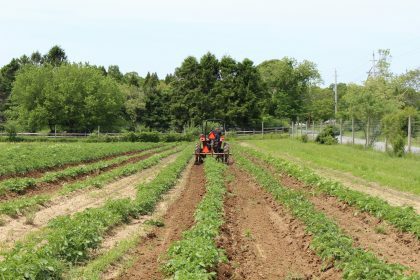 More and more land trusts are recognizing that in order to protect farmland, stronger easements must be used that ensure the land stays in the hands of working farmers. Grass Valley, CA- September 25th: Nevada County Farmers Guild. 6pm at Fowler Family Farm, 12332 Silver Springs Pl., Grass Valley, CA. Dane, WI- September 26th: Wisconsin Young Farmers Coalition and BareBones Co-op Farm. !Farm Party! A Celebration of Fall Pizza & Potluck. A great time to meet each other, talk farm, not talk farm and play a few games. There will be a $3 cup of something delicious. BYOB is fine too. Starts at 7 pm. 9pm Bonfire and Music. Live bands TBA You’re welcome to bring your own instruments. Bring friends, a dish to share, dancing shoes, a sleeping bag and tent if you want to stay over. 6389 Rimmel Ct. Dane, WI 53529, For more INFO or CARPOOL: barebonesfarm@gmail.com. Sonoma, CA- September 28: Sonoma Valley Farmers Guild. 6:30pm, Sonoma Valley Grange Hall, 18627 California 12, Sonoma, CA. Davis, CA – October 6: Yolo Farmers Guild. Collins Farm, 9055 Olmo Lane, Davis, CA. Sebastopol, CA – October 7: Sebastopol Farmers Guild. 6pm, Sebastopol Grange Hall, 6000 Sebastopol Ave, Sebastopol, CA. Mcpherson, KS—October 11: Kansas Beginning Farmers Coalition’s Central Kansas Family Farm Specialty Products Tour. Join us for several farm tours and lunch! RSVP for this free event here or RSVP to Nick Levendofsky at kfu.nick@gmail.com. Fort Bragg, CA – October 14: Mendocino Coast Farmers Guild. 6:30pm, Fort Bragg Grange Hall, 26500 North Hwy 1, Fort Bragg, CA. Omaha, NE – October 17th: Nebraska Young Farmers Coalition Meet Up! Come join other young Nebraska farmers as we meet up at the Kitchen Table in Omaha. Take a break from harvest, bring the kids, and enjoy locally crafted and sourced foods from the awesome chefs at the Kitchen Table. We’ll hear about the National Young Farmers Coalition as well as from other young farmers in Omaha. For more details email William at healthyfarms@gmail.com. Springfield, OR- October 17-19th: FarmOn Oregon! Farmers Rising: Beginning Farmer and Rancher Convivium. Two Rivers Farm in Springfield, OR Farmersrising.brownpapertickets.com. Willits, CA- October 21: Mendocino Farmers Guild. 7pm, Little Lake Grange Hall, 291 School St.
Lexington, KY November 14-15: Kentucky Beginning Farmer Conference. Click here for more info. Bluegrass Community and Technical College. Email Carolyn@cfaky.org for more info. Ghent, NY- November 20th: Hudson Valley Young Farmers Coalition Presents Six Figure Farming for Small Plots: Techniques for the Small Scale Intensive Organic Market Gardening with Jean-Martin Fortier, co-owner of Broadfork Farm and author of The Market Gardener. More info here. $15 RSVP to Kristen Loria at kal52@cornell.edu. Manhattan, KS- December 6: Kansas Beginning Farmer Day. Part of the Kansas Farmers Union State Convention. A Day of speakers and events presented by the Kansas Beginning Farmers Coalition. More info here. Sebastopol, CA- December 13-14: The Farmers Guild’s Feed Yourself Feeding Us Entrepreneurial Farm Business Intensive. 9am, Sebastopol Grange Hall. More info here.